I cannot wait to get my hands on these little beauties – Les Exclusives Collection by Chanel. How divine – imagine a whole row of them on your bathroom shelf? The one I would most like to try is Beige – it just sounds divine. Named after one of the favourite colours of Coco Chanel Beige is inspired by a fruity, sensual fragrance. 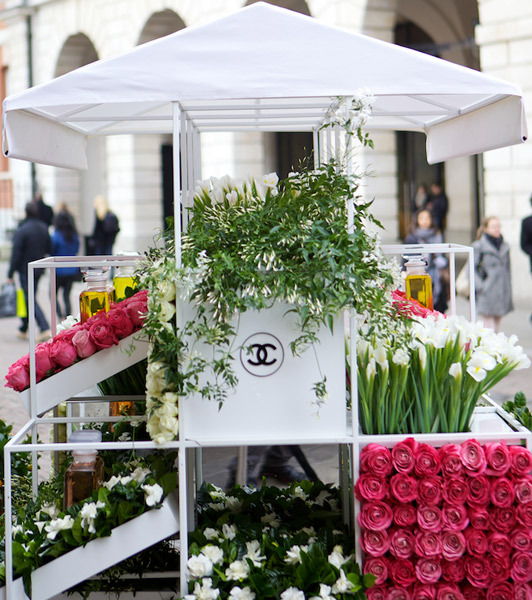 See below the super sweet Chanel Flower cart that is currently positioned in front of their pop up shop in Covent Garden, Chanel Beige nail polish and Chanel Beige fragrance. UVA & UVB why bother?